I’m back home from my mom’s now after the passing of my stepfather a little over a week ago. Life has pretty much returned to normal for me, although I feel terrible about leaving my mom in the house alone. The good news is she has tons of friends who are stopping by every day to check in on her, which is so wonderful. 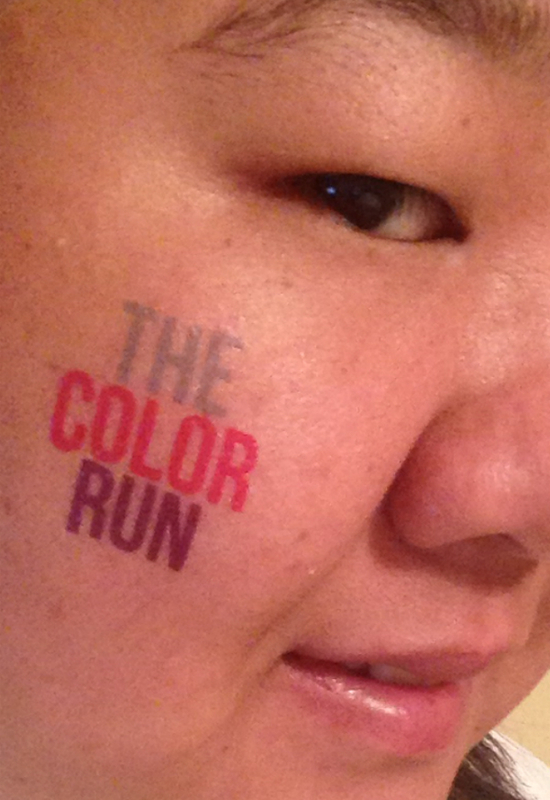 This morning I got up and ran The Color Run 5K. I had signed up for it back in February and have been looking forward to it ever since. Adam and I did Color Me Rad on Feb 2nd and had a blast so I knew this one would be good! We were able to walk to it from our apartment which was really nice since I’ve heard parking can be a mess for Color Runs due to the sheer number of people who show up. Since I was attempting a PR I made sure to arrive early so I could be in the front of the first wave. Normally I start somewhere in the middle because I’m no where near a fast runner, but looking around me I got the sense that most of the people lined up at the front were excitable walkers and I didn’t want to get caught behind them. I gotta say, starting at the front of the wave makes such a difference! It’s so nice to not have to do a lot of bobbing and weaving! There were more color stations at The Color Run vs. Color Me Rad and each station seemed to have a lot more color. Maybe that is because I was at the front of the pack in the first wave this time. At Color Me Rad I started in the third wave and a lot of stations had already run out of powder at that point. 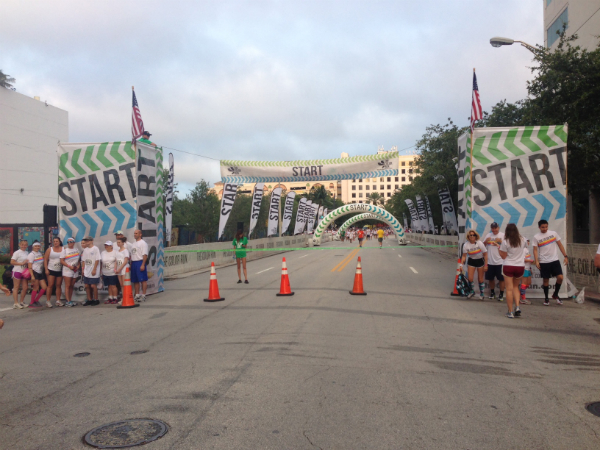 I hadn’t really checked out the loop beforehand and was surprised that we had to run through the Las Olas tunnel and also the Riverwalk bridge! I admit I ended up walking up the tunnel but when I hit the bridge I decided it was time to start picking off people and I powered up it! I just kept repeating “you don’t get better at hills by walking them” in my head over and over until I was finally heading down hill! I ended with a finish time of 39:10 which is a PR for me! Unfortunately, according to my Garmin the race was not a full 3.1 miles. That’s okay though I still had a lot of fun and finished feeling really strong. I could tell that my switch to running outdoors really helped. Every other 5K that I’ve run has left me feeling like death warmed over (the heat, the humidity, the hills!) but I felt great when I finished today! Other than Mickey’s Jingle Jungle this November, I don’t think I’ll be doing any more 5Ks for a while. While I may not be the fastest 5K runner out there I do feel ready to move onto 10Ks. Being a speedy runner has never been a goal of mine, but I do have lots of goals around distance! Speaking of which, today’s 5K capped off week 6 of my half marathon training!! My long run next weekend will be 7 miles! I’m already feeling excited and nervous about it – but I know I can do it! I’ve never done a Color Run. Sounds fun! Congrats on the PR! Good luck on your 7-miler. You can do it! Thanks so much! It was a lot of fun 🙂 I’m really looking forward to 7 miles this weekend. It sounds like such a serious number. I feel like if I can run 7 miles I am *really* a runner! haha. Great run. I have not done any of this sort of run but we have been leaning more towards the color run than the more insane (you are going to get hurt) sort. Even though I’m not a fan of the 5k distance, I REALLY want to do a Color Run!! I’d love to be in the front, too, I think, because I’d wanna get all crazy colorful! It really is a ton of fun – especially if you go with a bunch of other people. I did this one by myself but I did Color Me Rad with my boyfriend and some other people. I had a blast both times! Being in the front of the first wave is important though because the stations have more color to throw AND the event is likely to be crowded with a ton of walkers who don’t realize that they should be starting at the back of the crowd. The route can get congested really fast if it is narrow.